Today, no matter if you are a stakeholder, a successful entrepreneur, or a big behemoth of the market, your ultimate aim is to get the best out of business. As you have already read the title of what we are going to talk about, let's start with the basics of POS where we will not write a big blog explaining you about POS software and machine but will give you a rough idea about its operation. POS is a vast topic to discuss, hence we will be particular with our niche and that is Retail Software. POS (Point of Sale) is the place where the retail transactions take place. When you visit a retail store, you buy things and reach a point of sale where you have to pay the amount for the items you bought from the store. Now, what this POS actually is? What does it do with your transition? It calculates the amount that is to be paid by the customer, displays the amount, and prepare an invoice or a bill to handover to the customer as a record. It also indicates the relevant mode of payment which the customer can choose from. In short, it is a point where the customer pays for the goods he bought and in exchange, the merchant will issue him a receipt of the transaction. Now you will think how this Point of sale is helpful to elevate a business like a storm. Let's begin the real story. Investing in Point of Sale (POS) software may seem to be a waste of money or unnecessary spending, but believe me if you look from a business angle, it is a hen that yields golden eggs (sounds weird but true). You may find a significant profit if you are really into business tactics. POS or Retail shop software serves in various industries including Retail Stores, Restaurants, and even Hotels where the matter is all about how much you earned on a particular business day. POS definitely provides a new world of data to your business. The traditional cash register fails in many areas. Hence we will discuss some of the useful points that will be useful to get a conclusion for why investing in POS and Retail billing software is the best idea? The required accuracy : Cash registers work by pushing in buttons which may introduce errors while POS software brings everything to a computer, which gives you almost 100% accuracy. Control your stock : Biggest issues that are faced by enterprises and retailers is to manage their inventory. POS brings in-built inventory management. So you can manage your stock and retail on a single software. Instant Access : It gives you instant access to all your data including the items sold, date and time batch, promotional codes, etc. It gives a clear picture to the inventory manager that what is to be bought in the upcoming week, what is there in the condition to put it on sale, and so many other things. Intelligent business : Billing software for the retail shop is always a clever idea to take your business up without worrying about any loss of data or accuracy. Hence investing in POS or Retail software is the most intelligent business step you would have ever taken. Remote access : Improved technology gives remote access on Android platforms as well. It is Trending : Yes, if you want to win, you have to be updated and always ahead of your competitors in all the terms. I don't know if you have proper data about your competitors or not, but according to my experience, the Retail Software in India has reached up a peak level where each Retail Business is advanced, sophisticated and one step ahead form each other. Why be behind when you have such a prominent option to implement on your business. 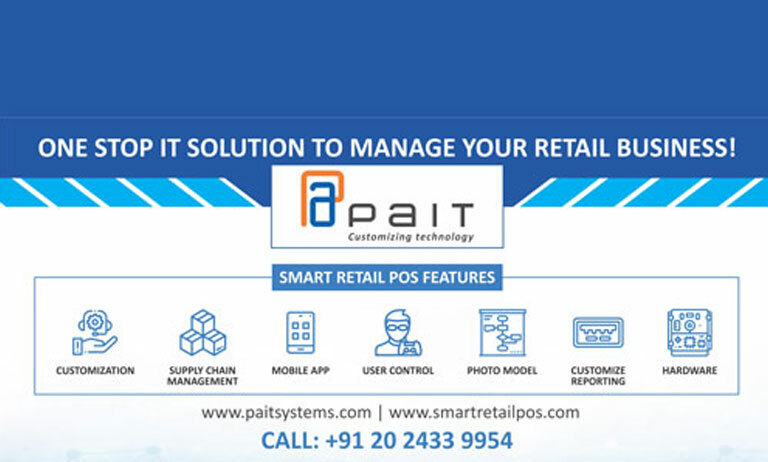 We at P A IT systems develop Retail software for all kind of retail business in Pune as well as all over India. Our idea is giving the best solutions to clients and customizes technology for them. We also deal in hardware AMC, where one need not worry about IT infrastructure; hence P A IT is one stop solution for retail software POS and hardware required for it.